Bratislava, February 7 (TASR) – Slovakia is interested in hosting the headquarters of the new European Labour Authority, with the country asking for support in this effort from German Chancellor Angela Merkel, said Prime Minister Peter Pellegrini (Smer-SD) on Thursday after a meeting with Merkel, who has come to Bratislava to take part in a session of Visegrad Four (V4) group leaders. Merkel didn’t comment directly on support for Slovakia regarding this matter. She did say, however, that she supports the idea of locating such agencies in new member countries. “We remain in contact and dialogue,” she said. “Germany isn’t only our key strategic and business partner, but we’re also close to each other in terms of values, what makes us at least feel like neighbours. 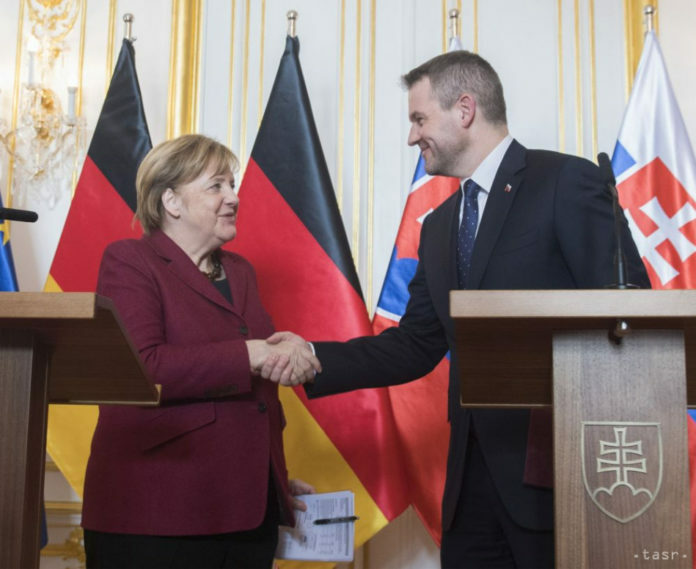 Germany is the most important trading market for Slovakia, it’s therefore in Slovakia’s key interests to have good relations with Germany,” said Pellegrini. Similarly, Merkel highlighted cooperation between the two countries, particularly in the automotive industry. “Given the fact that Slovakia has only 5.4 million inhabitants, it has a very good trade balance with Germany,” she said. The two leaders also discussed the case of the kidnapping of a Vietnamese manager who was allegedly abducted from Berlin via Bratislava. “We spoke about it briefly, and I have no doubt that Slovakia is doing everything it can to investigate this kidnapping,” stated the chancellor.